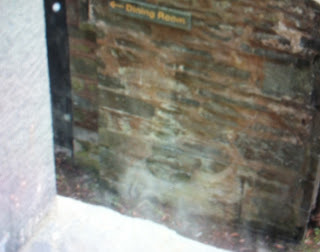 Hill Top house and the Beatrix Potter Gallery National Trust Team: Is this a ghost? Last week a couple who had visited Wray Castle, e-mailed us this photograph. Checking through their photographs after they returned home they found this snap taken through the window of an upstairs servants room and thought it looked like a ghostly apparition. could this be the ghostly horse of Windermere? Can you see it? They said they thought it looked 'like a faint white horse and a man' and asked us if anyone else had seen any similar ghostly sightings at Wray Castle? We're not aware of any other experiences like this but maybe you know differently? So it's over to you .... Have any of you visitors out there seen anything ghostly during your visit, or perhaps you were a student here when it was a residential training college and saw a ghost - do let us know!